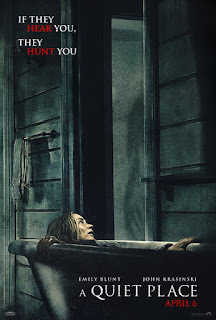 Although A Quiet Place was met with a high level of hype when it was released earlier this year, I was a bit hesitant to check it out. I was intrigued, but just not sure about it. Since the story centers on a family of four - director John Krasinski and his real life wife Emily Blunt as Lee and Evelyn Abbott, Millicent Simmonds and Noah Jupe as their children Regan and Marcus - living in a post-apocalyptic countryside, unable to speak out loud to each other because the world has become overrun with monstrous alien creatures that hunt their prey by sound, I was concerned that the movie would be dull, filled with slow and silent scenes of the Abbotts going about their lives. 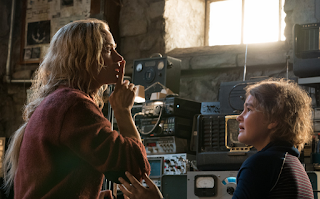 When I finally did catch up with A Quiet Place on home video, I was very pleasant surprised to see just how quickly paced and eventful it was. The movie starts with a shocking scene in which the Abbotts lose their youngest child 89 days into the alien invasion, then jumps ahead to day 472. All those days the story skips over, those were the slow and silent days. The days the film chooses to show us are the ones when the action occurs, when the lives the Abbotts are putting together for themselves gets torn apart in some way, when terrible things happen. In between tragic events, we get to know these characters and come to care for them. They interact almost entirely through sign language, which they had a head-start on learning before the apocalypse because Regan is deaf. 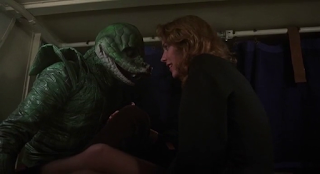 After setting up the characters and making sure we have an emotional connection to them, the film gets relentless - for more than half the movie, all of the Abbotts are right on the edge of becoming an alien meal for one reason or another. A stranger encountered in the woods draws attention, a bent nail threatens to cause someone to cry out in pain, Evelyn goes into labor because she and Lee made the insane decision not to take precautions in a world inhabited by sound-seeking monsters. While all of this happens, Krasinski proves to be a master of building suspense, something I never would have expected from the guy who played lovable goofball Jim on The Office. He has said that he has never personally been a fan of horror, but he's a hell of a horror filmmaker. This is truly a masterwork for him. In addition to directing and starring, he also rewrote the original screenplay by Bryan Woods and Scott Beck. I resisted the hype, but it didn't take A Quiet Place long to impress me and get me invested in what was going on. I was enthralled. 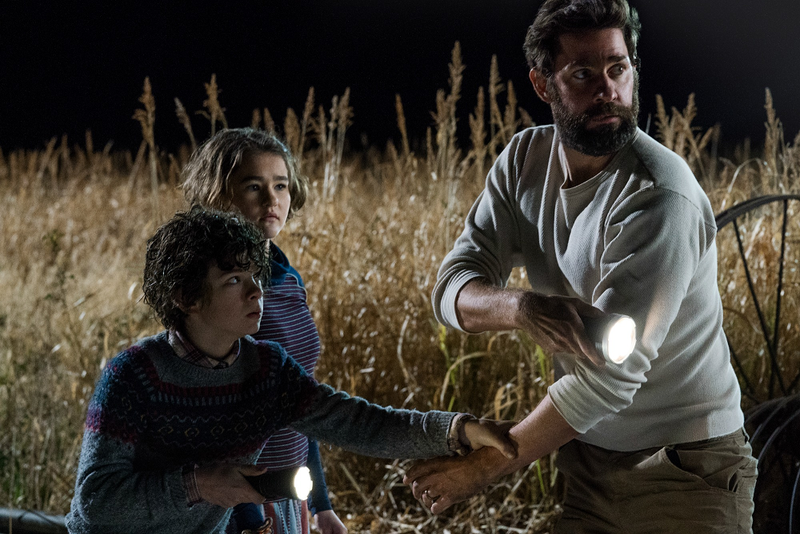 It was blog contributor Priscilla who finally got me to watch A Quiet Place, so I owe her one. Again. Director Michael Peterson's thriller Knuckleball is such an economical film, it's a little surprising that it has so many familiar faces in its cast, as this feels like something that would have been made on a very low budget with a cast of unknowns. It certainly could have been; the plot is about as simple as something can get and still sustain a feature length, it's set almost entirely at one location, and there are only a handful of characters - and just a few of them are actually involved with the action. But while the script by Peterson and Kevin Cockle is something that could have been brought to screen on a micro budget, this one did have some Canadian cash behind it, allowing for a cast that includes veteran character actor Michael Ironside, Ironside's Turbo Kid co-star Munro Chambers, Kathleen Munroe of Survival of the Dead and The Void, Arrow's Chenier Hundal, and Krista Bridges of Land of the Dead. 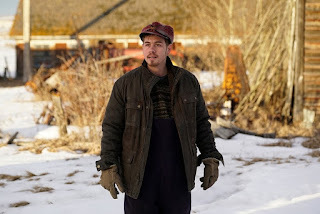 Child actor Luca Villacis (who genre fans might have seen in The Midnight Man and/or Channel Zero) takes the lead as Henry, and the film begins with his parents (Munroe and Hundal) dropping him off at his grandfather's remote farmhouse, nestled in the snowy countryside. This is where Henry's mom Mary grew up, but she understandably doesn't like visiting it since she found her mother dead in the barn, having committed suicide due to something Mary's father Jacob (Ironside) did. Even though Mary is haunted by the mystery surrounding her mother's death, she still thinks leaving Henry with Jacob for a couple days while she and her husband go off to attend a funeral is a good idea. So we're left to wait and wonder, what secrets is Jacob hiding? Knuckleball is one of those films where you know something is going to go terribly wrong, you've been tipped off by the fact that it's categorized as a thriller, but it's just not clear what's going to go wrong or how. Peterson takes some time before answering any questions, and this thriller takes some time before it starts to get thrilling. 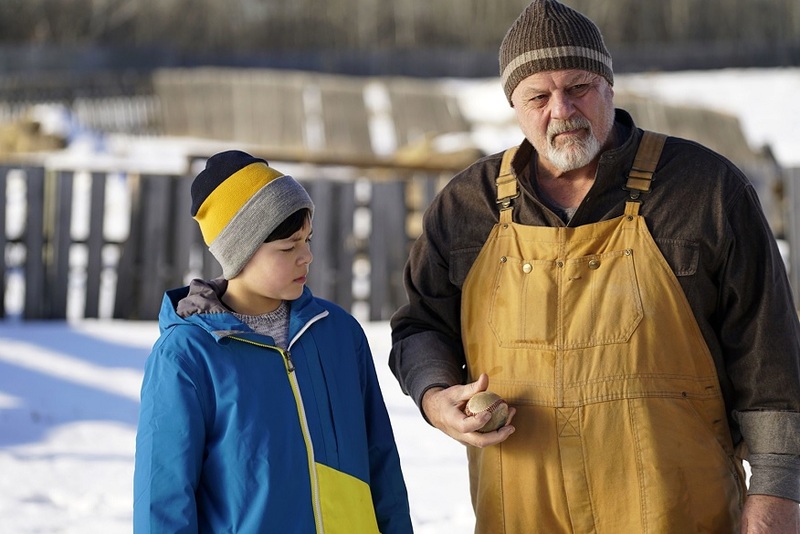 Until then, Henry and Jacob bond while doing some work around the snowy farmland, and Jacob helps his baseball enthusiast grandson practice his pitching skills. 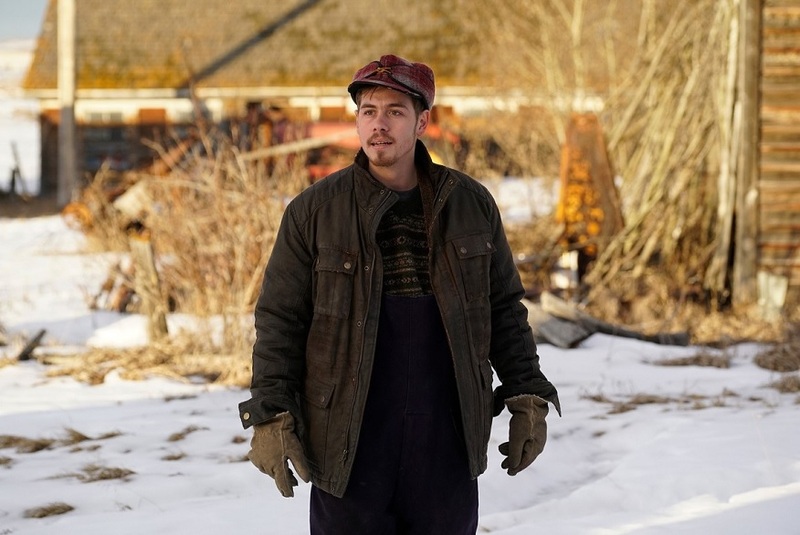 During his first day on Jacob's farm, Henry also meets helpful neighbor Dixon (Chambers), who is such a creepy oddball from the moment he steps on the screen that it's obvious he's going to have something to do with the terrible things to come. You'll just have to wait until about halfway through the movie to really find out how he'll be involved with whatever bad stuff Henry will have to deal with. 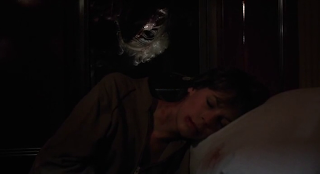 The bad stuff begins when Jacob passes away during the night. After the build-up, Knuckleball is pretty much non-stop thrills for the final 40 minutes or so, as Henry is now stranded on Jacob's farm with no way to contact the outside world - his cell phone has died, he doesn't have his charger with him, and a winter storm has knocked out the landlines. As if sharing a house with his grandfather's corpse wasn't enough, Henry is soon forced to fend for himself against a relentless homicidal intruder. Knuckleball has drawn comparisons to Home Alone for the way Henry deals with the killer lurking around his grandfather's house, but if you're wanting to see the film in hopes of watching a killer stumble through a series of elaborate booby-traps, you might want to temper those expectations. There are a couple scenes where Henry pulls from the Kevin McCallister playbook to defend himself and injure his attacker, but they don't take up a substantial portion of the movie. It's cool, but it goes by quick. There is very little to this film, but by the end it has proven to be a perfectly serviceable thriller. It's got some mystery, some dead bodies and bodily harm, you get to watch some Canadian actors you've probably seen before share the screen, and Villacis turns in a sold performance as our likeable little hero. Peterson achieved a very foreboding atmosphere in the first half of the film, and the build-up is paid off with some entertaining violence in the second half. If you've got 88 minutes to spend watching a movie, Knuckleball is a fine way to fill that time. You might think that a slasher directed by someone who would be at the helm of a James Bond movie within twenty years (Roger Spottiswoode, director of Tomorrow Never Dies), starring the heroine of Halloween and the coke-sniffing moron from Die Hard, and featuring magic tricks by David Copperfield would be a can't-miss combination, and it is for a lot of horror fans. But even though all of those elements are present in Terror Train, this is one '80s slasher I've never really been into. The movie starts losing me right in the opening sequence, which has Jamie Lee Curtis's good girl character Alana Maxwell taking part in a disgusting prank orchestrated by Hart Bochner as med student Doc Manley (Bochner was Ellis in Die Hard) at a fraternity's New Year's Eve party. The prank is being played on nerdy pledge Kenny Hampson (Derek MacKinnon) and involves Alana luring him into a bedroom, where he finds he has actually climbed into bed with a cadaver that's falling to pieces. Kenny freaks out, understandably... but goes even further than you might expect. It's a very weird way to get things started, and the use of a cadaver is really gross. That's already enough to ensure I'm not going to like any of these people. Three years later, Doc has set up another New Year's Eve party, this one a costume party that will take place on an excursion train. There's plenty of alcohol, a magician played by real-life illusionist David Copperfield has been booked to perform for the college kids, and Alana has been tricked into coming to the party by her boyfriend. She never wanted to go to another Doc Manley party. This is definitely a party to avoid, because someone starts picking off the parties one-by-one. Impalements, decapitations, and other bloody deaths ensue. One thing I can really give Terror Train kudos for is the clever decision to have the killer switch costumes with their victims after every murder. It's a nice touch, and you get to see the killer in several different costumes over the course of the film. 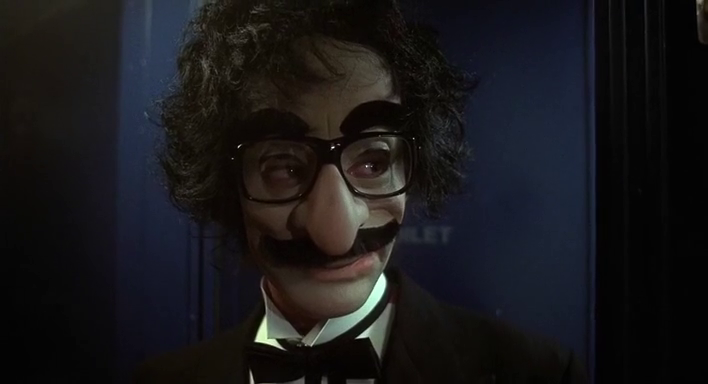 A Groucho Marx mask, a lizard costume, an old man monk outfit, etc. My real problem with Terror Train is, it feels like a slog to endure to me because I don't like a single one of these characters. The ones that aren't bland are total jerks, the exception being Ben Johnson as conductor Carne, who does what he can to deal with this situation when he realizes people are getting hurt on his train. Not even Curtis can turn Alana into an interesting character. She's upset with Doc and his cohorts, but not upset enough, and her wishy-washy attitude makes her come across as being weak. Thankfully she steps up as the film goes on and becomes a decent heroine in the final minutes. Those final minutes are what save the film. I might find what comes before to be dull and off-putting, but the last 14 minutes or so of the movie consist of a really good chase sequence on the train. Curtis again shows she's not someone to be messed with by these slasher characters, and lets loose some good screams while getting covered in blood. England has James Bond. America has Jack Flack, the secret agent hero of the Cloak & Dagger role playing games and Atari video games who drops into dangerous situations with a Old Glory parachute and can maneuver his way out of any life-threatening jam. For young Cloak & Dagger fan Davey Osborne (Henry Thomas), whose mom recently passed away, Jack Flack looks a lot like his dad Hal (Dabney Coleman), who has been struggling to pick up the pieces since becoming a widower and single father. 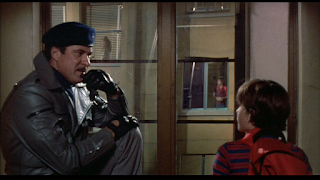 Davey is maybe a little too fascinated with the Cloak & Dagger games; Jack Flack is his imaginary friend, and Davey can even be seen walking around in public places talking out loud to this guy who isn't really there. Unfortunately, he's going to get his chance to live out a real life espionage adventure. When a Cloak & Dagger game cartridge with top secret information hidden in it ends up in Davey's possession, the kid is soon being pursued by spies and assassins, and this film doesn't pull punches like a modern kids movie might - Davey really is in mortal danger, and not everyone gets out of this situation alive. For example, Davey's adult gaming buddy Morris, who's played by William Forsythe and looks a lot like you'd still expect a computer / gaming enthusiast to look like in a movie today. He's toast. Davey might even be responsible for some deaths himself. 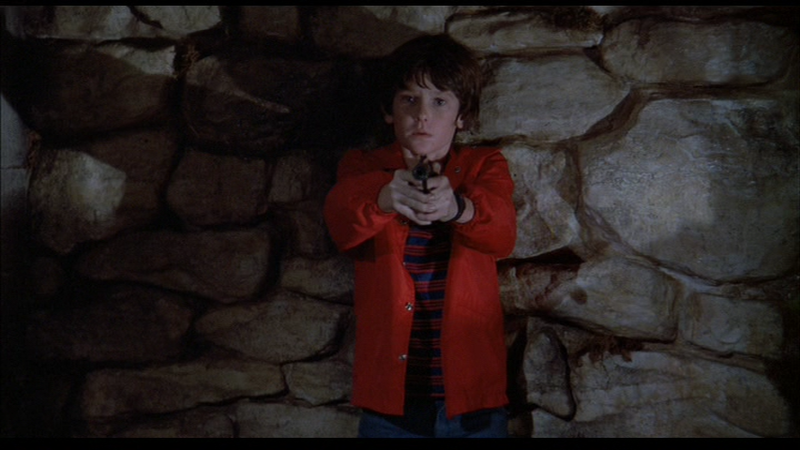 A re-teaming of Psycho II's writing and directing duo Tom Holland and Richard Franklin, Cloak & Dagger is a kid-friendly film that I somehow missed out on in the late '80s and early '90s, but I still had fun catching up with it in 2018. 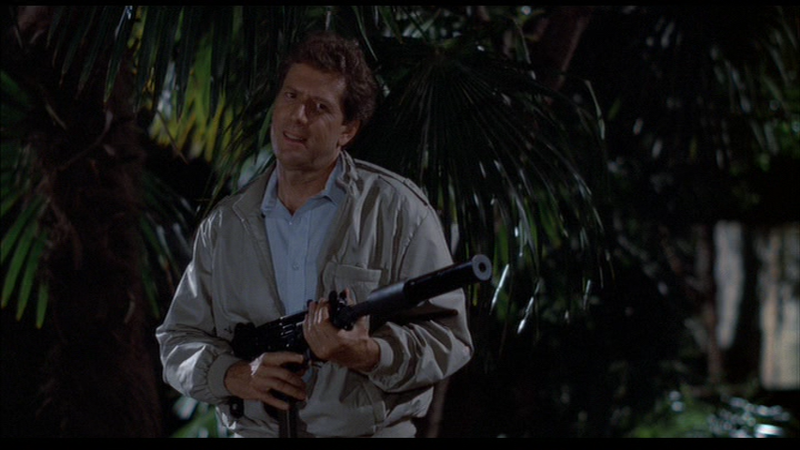 It has a touch of Bond and the feel of the action adventure films of the '80s, and that sort of movie is very appealing to me, even more so today than it was when I was a kid. The only extra benefit I might have gotten out of watching it when I was around the age of Davey is that back then I probably would have been extremely creeped out by the elderly spy couple Davey crosses paths with along the way. Homicidal old people is not a concept a kid wants to be confronted with. If you're a fan of franchises like James Bond and Indiana Jones but haven't seen Cloak & Dagger, this is definitely one to seek out.